Uncommon Reliability and Durability in Hot Water Applications. 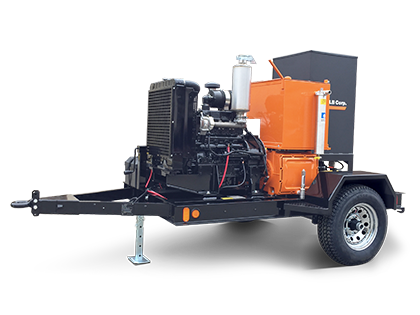 NLB’s new 335 DHW-TRA-SA Hot Water Pressure Jetting Unit is the perfect choice for meeting the demands of your next project. At the heart of this unit is a powerful and dependable triplex pump capable of 15 gpm at 3,500 psi. A Kubota v3600 (66 hp) diesel engine provides the power in a direct drive configuration that eliminates the PTO and PTO maintenance. In addition to the upgrade in power plant and pump, NLB also integrated an industry-leading 700,000 BTU burner unit to address the demands of the many cycles, long hours and transportation requirements in the life of a typical hot water unit. Features not typically found on hot water units available have been incorporated into the 335DHW-TRA-SA that make for a better operator experience and lower maintenance costs. An overhead mounted water tank is easy to winterize and has integrated water lubrication lines and a 75-micron inlet strainer that can be rinsed or cleaned, eliminating the traditional filter. A rupture disk has also been eliminated from the unit’s design and replaced with a self-resetting pop-off valve, saving time and money for the operator. Looking for the NLB 535 DHW-TRA-SA?